The novelty Voyage Bleu Chronograph Limited Edition is presented in a round case with bezel in 18-carat pink gold or stainless steel. Hour markers with blue luminescent fit the black dial. Indication of hours and minutes is carried out by means of two central skeletonized hands with blue luminescent. The pointers are located at the 3, 6 and 9 o’clock position, the date aperture - between 4 and 5 o’clock positions. A gold medallion with the image of the ship decorates the back cover. The watch water-resistant - 200 meters. 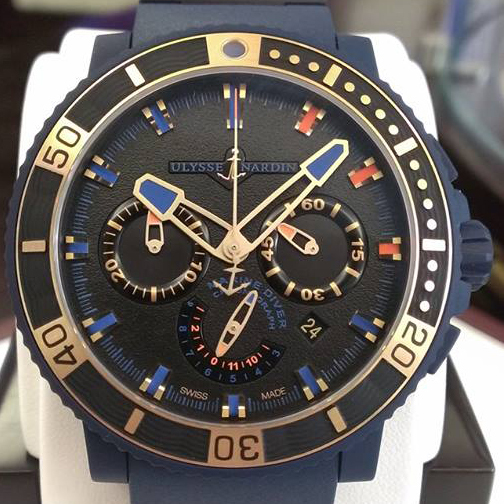 The manufacture Ulysse Nardin has created a model Voyage Bleu Chronograph with the calculation of the Turkish market. The debut presentation of the novelty was held at the restaurant Poseidon in Bebek, Turkey. In addition to exclusive guests, 60 journalists attended the event.